“Moonlight is magic. 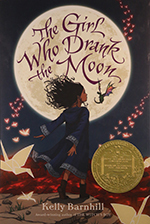 Ask anyone you like.” Barnhill’s story is also pure magic, distinguished by careful development of a complex plot and indelible evocation of unique characters. Love, heartbreak, hope, sorrow, and wonder all shine in exquisite, lyrical prose. Twelve-year-old narrator Josh Bell uses the rhythms of a poetry jam to emulate the "moving & grooving/popping and rocking" of life on the basketball court with his twin brother, J.B. This powerful novel in verse paints an authentic portrait of a closely-knit family on the brink of crisis. Comic book fan and natural-born cynic Flora Belle Buckman and Ulysses, a flying, superhero, poetry-writing squirrel, join forces to overcome Ulysses’ arch-nemesis, Flora’s mother and encounter a quirky cast of characters. Thirteenth-century England springs to life using 21 dramatic individual narratives that introduce young inhabitants of village and manor; from Hugo, the lord's nephew, to Nelly, the sniggler. An engaging character tale, this is the story of a 10 year-old girl named Lucky, growing up in the care of an absentee father's ex-wife, in a tiny California desert town. Fearful that her caretaker will abandon her, she considers the alternative: running away. A gentle, humorous story of two 14 year-olds, searching for who they will become. The author insightfully captures the concerns and thinking processes of many young teens. It's 1937 and Joey has gone off to work for the Civilian Conservation Corps, while 15-year-old Mary Alice has to go stay with Grandma alone--for a whole year, maybe longer. From the very first moment when she arrives at the depot clutching her Philco portable radio and her cat, Bootsie, Mary Alice knows it won't be easy. And it's not. She has to sleep alone in the attic, attend a hick town school where in spite of her worn-out coat she's "the rich girl from Chicago," and be an accomplice in Grandma's outrageous schemes to run the town her own way--and do good while nobody's looking. But being Grandma's sidekick is always interesting, and by the end of the year, Mary Alice has grown to see the formidable love in the heart of her formidable Grandma. A powerhouse sixth-grade Academic Bowl team from Epiphany Middle School; the art of calligraphy; the retirees of Century Village, Florida; a genius dog named Ginger; and a holiday production of "Annie" all figure heavily in the latest book by E. L. Konigsburg. 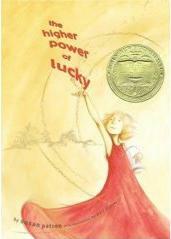 The book centers around a group of four brilliant, shy 12-year-olds and the tea party they have each Saturday morning. Konigsburg's wacky erudition and her knack for offbeat characters make this a funny and endearing story of friendship. Thirteen year-old Salamanca Tree Hiddle's mother has disappeared. While tracing her steps on a car trip from Ohio to Idaho with her grandparents, Salamanca tells a story to pass the time about a friend named Phoebe Winterbottom whose mother vanished and who received secret messages after her disappearance. One of them read, "Don't judge a man until you have walked two days in his moccasins." Despite her father's warning that her mother is "fishing in the air," Salamanca hopes to bring her home. By drawing strength from her Native-American ancestry, she is able to face the truth about her mother. 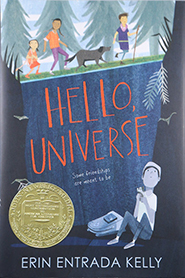 In a world with no poverty, no crime, no sickness and no unemployment, and where every family is happy, 12-year-old Jonas is chosen to be the community's Receiver of Memories. Under the tutelage of the Elders and an old man known as the Giver, he discovers the disturbing truth about his utopian world and struggles against the weight of its hypocrisy. With echoes of Brave New World, Lowry examines the idea that people might freely choose to give up their humanity in order to create a more stable society. Gradually Jonas learns just how costly this ordered and pain-free society can be, and boldly decides he cannot pay the price.